If you are about to go on camping either to the river or to the forest, do not forget to consider buying a best truck bed tent. Truck bed tent can be either used to expand your space of the vehicle or even as the standalone tent for you to relax or sleep. And, to be the perfect fit with different trucks, truck bed tents come in many different designs. So, let’s get through the article together to get to know the top 10 best truck bed tents of the year. The first item on our review list today goes to the best truck bed tent from Kodiak Canvas. It is made from cotton duck canvas which is really durable, watertight and even breathable. It comes with the tunnel shaped design which offers the maximum interior space and high ceiling height. The tailgate design allows the user to expand the space so that you will have more space to use. They design this one with the large D shape door that is already attached to the YKK zippers with the convenient gear pockets on the outside as well. You can use this one in all season but the thing is do not forget to check out the compatible car model. SportZ comes with the idea of creating another truck tent that is perfect for 2 people. It is the only tent that has the sewn in floor with over 5.6 feet of headroom for couple. This tent offers the large rear access panel that can be used for additional storage as well as the large entrance door, windows and side vents that can provide the great ventilation. 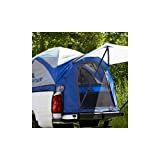 It is shipped along with the shade awning that will secure the tailgate and is easily to be set up anywhere you want. Plus, it is available in two colors, blue and grey, so choose your favorite one. If you are finding the truck tent that can fit full size vehicle, consider this. It can fit the cars with a rear window with the high back and flat back camper tops. Additionally, this one can also cover over the carrier rack or air foil as well. The tailgate that features along with this one is equal or even greater than 58 inches wide so that you do not need to worry that you have less space to use anymore. By the way, it is not perfect matching with the vehicles that have an external rear mounted spare tire. Next, we are going to check out some specification and what this Rightline truck bed tent can do. It is built with the heavy duty straps along with the nylon buckets that will make sure that your truck still stay in the same shape. They feature this one with the fabric that resists with water which attaches to the tape. This tent is ideal for 2 adults, and each purchase will get a pack which contains a tent, rainfly, stuff sack and sewn in set up guide. This one is much easier for you to set up. You can just get the cord with plastic coated hooks to attach with the underframe of the vehicle, it is ready to use. You can fold up the outer door and tie if back in for the maximum ventilation or you can just zip and tie at the bottom corners if you want your own privacy. To add more, there are another 2 way zippers which offers the easy entry to the rear of your vehicle. Now, you are looking at the tent from Honda that can be either used to attach to the truck or used as a standalone tent. You can expand your area by using this tent and it also provides the protection for the entire roof as well. The floor is designed with the high quality rip stop polyethylene that is really perfect for outdoor gathering such as trips or camping in the forest. Here is another truck tent that comes along with the sewn in floor inside. The interior are is very large with around 5.6 feet of headroom while there are another 2 large windows with the middle divider that offer you many options of ventilation. The rear access door of this tent is capable of letting you access for additional storage as well and with the color coded pole and sleeve system, you will spend less time to set this up. Another best truck tent in line comes from SportZ. They use polyester taffeta as the material to build this one out. They attach this one with the rainfly that can withstand the bad weather perfectly. There are also 2 interior pockets and another 2 vents attached to this truck tent for your easy access. It is possible for 2 adults to sleep in this tent and you do not need to worry that there will be flies or bugs come through your tent, too. Let’s take a look at this Napier outdoor truck tent. This tent comes with the dimension of 60L x 68H in inches with the material made from polyester taffeta. Another thing is you can assemble this one much easier with just the help form the guidebook shipped along in a pack. To clarify, it can fit the 5 feet truck beds that can work with sprayed liner and such. You are ensured to get the super durable tent ever if you decide to buy this one. This is one of the truck bed tent that come with the very light weight and can resist well with water. It is made from nylon and comes with 3 colors options which are gray, blue and black. With the lightweight design combined with the water resistant nylon, you can change your own vehicle to a sleeping tent for your camping in just a blink of eye. 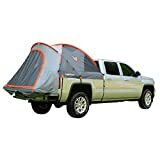 Provided above is a curated list of the top 10 best truck bed tents in 2019. Each of them is really easy to assemble, and will sure meet your needs. Hence, with such practical designs, we are certain that you should consider getting one that will help you enjoy the maximum enjoyment of your travels.